You are here: Home > News > Hilden Mill- Hope for a Heritage Led Future? Occupied from 1823 and listed Grade B+ since 1989, Barbour Campbell’s Thread Mill in Hilden was the beacon of industry of the village and surrounding area. The Barbour family are of national interest as the former leading manufacturers of tailors’ shoe makers’ sewing threads in the world and the mill buildings represent one of the few flax spinning/thread manufacturers to survive in a largely instate state anywhere in the Province. The mill buildings are of considerable architectural and historical interest and the materials used reflect the buildings periods of construction – basalt in the mid 1800s, brick during the later 1800s and finally concrete in the 1900s. While many are also embellished with decorative brickwork on their quoins and eaves, and some have carved heads. Internally reveals an extensive use of brick jack arches that reflect the structural imperative for the floors to be both fireproof and a high load bearing capacity. The mill since closed its doors, and has been on the Built Heritage at Risk register for Northern Ireland, since 2005. For more than a decade the future of the complex has been in question. A previous approved planning application to develop the Mill complex into a mixed-use development and 600 homes was approved in 2007. This has now lapsed. The halt in progress over this time period has resulted in greater deterioration of the buildings where they have been subject to vandalism, including fire. Despite the effect of this deterioration, UAHS maintains that the complex, and the buildings therein, remain capable and deserving of re-use and restoration. An opportunity not to be missed. The recent sale of Barbour Campbell’s Mill sparks new hope that the site will finally see a new lease of life. The St Francis group, who were part of a group who recently bought the Sirocco site in Belfast, have been identified as the new owners. The UAHS support the sale of the complex and hope that a heritage-led regeneration project can now progress. 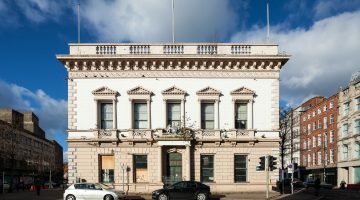 The Built Heritage at Risk Northern Ireland Register is maintained by the Ulster Architectural Heritage Society, in Partnership with Historic Environment Division, Department for Communities NI.